The first time I got a gold legendary shield in Apex Legends, it was the greatest feeling in the world. "This is it," I told my squad of two other friends, with maybe an expletive in there. This was the match; this would be the first game I'd win with actual buddies at my side, and not randos pinging constantly as we loitered in relative silence, off-mic. But this was not it. This was not the match. At the very least, I was able to revive myself once downed during one tense encounter—the perk of the golden shield (as every legendary item has a special bonus perk). That fleeting success is emblematic of what makes Apex Legends tick. The covetable tiers of gear, the ability to survive encounters even when another squad gets the drop on you, the mesh of hero characters' varied abilities that work together. 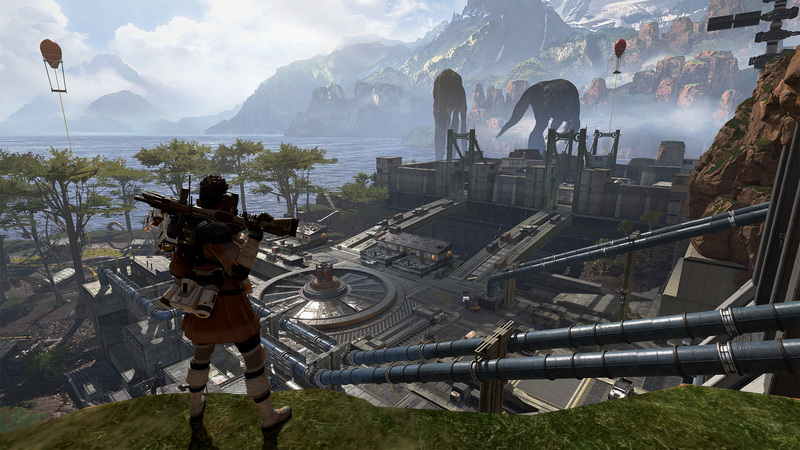 Apex Legends, despite its woefully generic sounding name, has a lot of factors that make it stand out in the crowded battle royale genre. 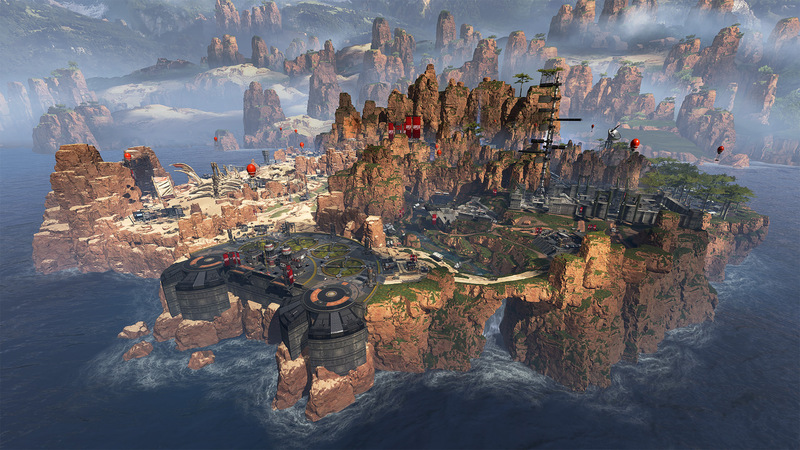 Like other battle royale games, Apex Legends is about a bunch of players dropping onto an isolated island (for most it's around 100, for Apex Legends it's a clean 60), left to fend for themselves, kill other players, and emerge as the last survivor. It's basically Last Man Standing mode, but at a much larger scale. The genre was pioneered by modder PlayerUnknown, who adapted it into the genre's early hit PlayerUnknown's Battlegrounds, which was then superseded by the international megahit Fortnite Battle Royale. The rest is history… until Respawn and EA surprise released Apex Legends in early February, a battle royale game set in the Titanfall universe. Matches in Apex Legends have significant pacing issues though. While some matches are exciting—and with armor being a permanent attachment, there's more of a chance of you surviving encounters than in other battle royale games—other matches are plain dull. In PUBG, skill necessitates surviving all encounters; in Fortnite, the survivor of the final circle is usually determined by who can build the most efficiently to protect themselves. In Apex Legends, it's more up to teamwork. That's its chief difference compared to other battle royales: Apex Legends is also a hero shooter. Players are nudged into three-person teams, with a variety of "Champions" to choose from. At the start of a match, players choose a Champion to play as, but it's not a free for all: who chooses first, second, and third is assigned in a random order. All the Champions have a passive ability, active ability, and an ultimate move. The latter two run on a cooldown meter. Currently, there are nine Champions in total; from the outset, only six are unlocked, with the other three costing 12,000 Legend Tokens (earned in-game), or 750 Apex Coins ($10 will get you 1000 Apex Coins, for reference). Each time you level up in-game, you net 600 Legend Tokens, so it's easy to build them up relatively fast if you play often. With the creators of Titanfall behind it, one thing Apex Legends has the best of compared to most other battle royale games is its gunplay. The guns scattered among shacks and industrial buildings all feel unique, even if some are laughably not worthwhile (the Mozambique Shotgun has become a joke in the community). Such as the Wingman, a strong pistol that requires precision and is particularly deadly with the Skullpiercer attachment; or the Peacekeeper, a shotgun with a short charge that you don't want to be caught in close quarters with. The guns in Apex Legends, while not across the board perfect (the Flatline has an annoying recoil, and so on), have enough variety and attachments to make or break matches. Also, in a peculiar addition, there's no solo or duo mode in this royale either. It's teams or nothing at all. 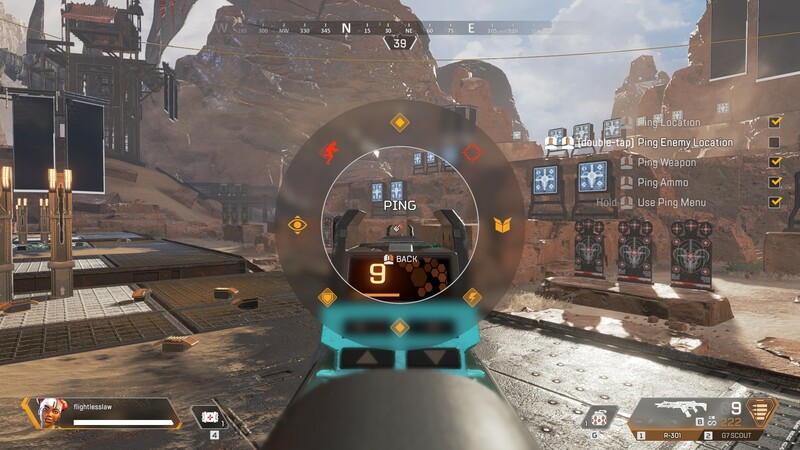 But as I quickly found, it's a lot better this way, and it's made a lot easier with Apex Legends' groundbreaking ping system. With pings (versions of the mechanic seen before in games like Ghost Recon Wildlands), teams are able to work together wordlessly. See an open door in the distance? You can ping it, letting your squadmates know that they might not be alone in this area. See a good gun that could be useful to a teammate? You can point that out too with the click of a button. See an enemy in the distance? You can hold down the ping button to pull up a roulette of options, and choose enemy movement. The pings are revolutionary not just to anxious gamers like me who don't like going on chat with strangers, but people with disabilities that prohibit them from easily speaking on voice chat for video games too. With the ping function, everyone can contribute to their team; something that feels sadly rare for modern video games. Pinging is what's kept me coming back to Apex Legends. Even when my friends are offline, I find myself hopping into a few matches (which often turn into a dozen or more matches if I get on a good roll). Pinging makes me feel like I'm contributing to the team in a meaningful way, unlike in Overwatch or other hero-based games where I look at the build of my team and just choose what character I think would best complement everyone. By that process, I am almost always, unfortunately, a support. And that brings me to something else that's refreshing about Apex Legends: players don't guffaw over the idea of playing a support. I've even played matches with two supports at once—Lifeline and Pathfinder. It helps that "support" doesn't necessarily denote healing, which happens to be Lifeline's job. Pathfinder, contrarily, is more of a situational awareness kind of support. At certain spots on the map, they can hack into a tower to reveal where the next circle will be, after the current one closes in. Pathfinder can also use a grappling hook and conjure a handy zipline to help the speed of traveling. In the too many hours I've spent since, I've found Lifeline to be a mainstay in my squads. And it makes sense too: she's useful in helping a team recover from a firefight. It's proof that using her as the leading tutorial character worked, because no longer do I feel low-key pressured to select the lone support now. Chances are, by the time I'm choosing my hero, she's already been plucked. Earlier this month Apex Legends introduced its first big load of content: a Battle Pass and a new character named Octane. Octane is great; he's a Champion built for speed and with his jump pad ultimate ability, is great at surprising unsuspecting squads and making quick getaways. The Battle Pass, however, is another story. At the outset, you're rewarded with three Champion skins for Mirage, Lifeline, and Wraith for purchasing the battle pass. The downside is that's pretty much it, sans one other character skin unlocked at Tier 48 for Octane. The rest of the rewards for the 100 tiers lie in seasonal trackers, weapon skins, quips, Apex Coins and Packs, and more. Leveling up in the Battle Pass is also very, very, very slow, making progression barely feel like it's even happening. Overall, the rewards are extremely underwhelming. In the base game, my one grievance with the unlockable system is that aside from cool banner customization, the characters themselves don't have particularly neat skins like, say, Overwatch does. It may be early in Apex Legends' lifespan, but desirable skins for Champions to work towards should be downright essential, and the new skins offered in the Season One: Wild Frontier pass are frankly boring. Luckily, I'm having such a great time that the lack of cool cosmetics isn't weighing me down too much. While it's a bummer, the core loop and comradery I feel with friends and strangers alike while playing is enough to keep me playing. At least, for now. This is all to say: how do you review a game like Apex Legends, a game so obviously "not complete," with only the foundation to build upon the future? That's partially why we waited so long to properly review it, to get a glimpse at the sorts of updates the seasonal structures will bring players. While Season One has already been raised as a disappointment, it could serve as an important lesson going forward for Respawn. Season Two has a chance of delivering the sort of goodness that Fortnite and Overwatch deliver on a seasonal basis. As for its future, we'll definitely be watching it closely, and playing it, obviously. I already have a routine of putting a couple hours into it almost every night. While I don't have a main-main yet, I do lean towards Caustic (the edgelord spewing man with poisonous smoke bombs), and now newcomer Octane too. Even if I am doomed to abandon Apex Legends one day, as I do eventually with all multiplayer games, I'll look back on it fondly as the game that let me not be pigeonholed as an always-support. Tagged with EA,	FPS,	Free-to-Play,	PC,	PlayStation 4,	Respawn Entertainment,	Reviews,	Shooters,	Xbox One.